As a farewell, I would like to leave you Letterman-style. Here are the Top Ten Worst Awkward Everyday Moments, according to the Dailypress.com. Might I add, that every single one of these instances has happened to me, as I'm sure you can relate... enjoy! You spot the perfect gift and it's the only one left, but just as you go to grab it, somebody else reaches for it as well. How do you handle it? Let them have it even though you really want it? Try to reason with the other person? Flip a coin? This situation can get tricky, especially on a Black Friday. 3. Walking in on someone in the bathroom. You walk into the bathroom and push open the door and much to your surprise somebody is already in there and neglected to lock the door. Now both you and the other person are embarrassed because entirely too much has just been shared between the two of you. It is a horrible feeling to have forgotten somebody's name. Whether it happens when you run into an old friend whose name escapes you or when you are trying to introduce somebody, forgetting who someone's name is always awkward and uncomfortable. "Entourage" star Adrian Grenier has been spotted before with the age-old embarrassing moment of being caught with your zipper down. It can be almost as awkward to point it out to somebody. What do you say when somebody accidently sneezes on you? Are you calm about it and forgive them or do you give in to your emotions and flip out because the other person was incapable of covering their contagion? See comedian Dane Cook's routine about how he reacts when somebody sneezes on him in public. It is smelly and embarrassing, but flatulence happens. Good luck keeping your composure when you realize somebody has slipped one. First, try blaming nearby animals. Ever checked your e-mail at work or in a public place and had something embarrassing pop up? Joke e-mails are entertaining in the right place at the right time. Not having any money on you can be helpless feeling, and it can happen to anyone. Walking up to the checkout counter at a grocery store and realizing that after you've checked all your groceries but have no form of payment? Ugh. I work at a nice golf course, and enjoy playing the game as well. I'm always looking to bring people out to play a round, and introduce them to the course. The bonus is, that my guests get a great discount when I bring them out. A couple of weeks later, I got an email from him. He asked if he could play golf on Saturday, at that great guest rate that I said I could get. I felt so awkward, and didn't know what to say...I was completely shocked that he asked. I politely responded saying that I was actually working, so I wouldn't be able to play on Saturday. I said maybe some other time, and apologized. "Katie, sorry for the confusion but I was implying that I wanted to come out and play with a foursome there. Not golf with you. Sorry about that. Is that deal still up for grabs?" WOW. So, not only did I misinterpret the original question, I now CREATED the awkwardness that followed, by assuming he wanted to play golf with me, alone. I believe my face was beyond beet red at this point. Needless to say, I ended up getting him onto the course, by pulling some strings. I didn't particularly want to, but that's just how nice I am, I suppose. Since then, I have tried not to jump to conclusions, and re-evaluate questions before I submit a solid response. Can you relate? This story is 100% true. I'm walking with a classmate, across the college campus. It was a day or two after we got a heavy downfall of snow. As we pass our student council's building, I stop to point out some window painting "talent". 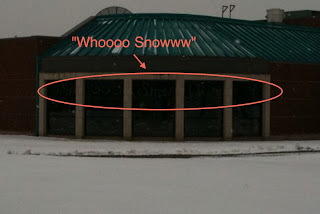 Across the windows, the person painted "WHOOOOOO SNOWWWW", when in actuality, I knew they meant "WOOOOO", being excited for the white stuff. As I point this out, I realize that I need to take a picture to show my grammar teacher. I knew she would appreciate it. Just then, as I'm holding up my iPhone and telling my classmate Kevin that I don't know if the letters will show up, two girls approach. "You like the windows eh!" a girl with blue hair says. "Uhhhh yea...." I start to say. She cuts me off and says, "Thanks, I did them myself actually. The Student Council president just calls me whenever they'd like something done on the windows," the artistic girl boasts as she looks at her bored friend. "Well... look at that," is all that I could say. When I really wanted to say was "don't quit your day job." Kevin feeling equally awkward, says, "You did a really good job," as he fake-smiles. While all of this is going on, I still have my arms extended to take the picture with my phone. I'm just holding my phone there, trying to justify what I'm doing, and yet hide it at the same time. The girl smiled and skipped away with her friend. "WHAT are the ODDS of THAT?" I yell to my classmate. We were laughing so hard, and yet, had to keep it down because the two girls were walking in front of us now. For the record, the photo did not turn out well, because it was so cloudy out. Here it is, below. You'll notice I tried to show you where the paint was. I will admit, we all make spelling mistakes. However, I found it funny that this was so blatently wrong and displayed to the public, I had to share. The point of this story is the fact that out of thousands of students, the one person who painted it walked up to me. I still cannot believe this really happened. In high school a friend of mine thought it would be funny to encourage this guy to ask me for my number. I had no interest in him whatsoever. I was unaware that she told him to ask me, but it happened. Standing at my locker, a million things were running through my head. And when I say 'things', I mean excuses. I honestly debated giving him a number that started with 555... but he wasn't too bright, and I knew he wouldn't get the hint. Instead, I quickly came up with a solution. I gave him the number, and smiled as I did so. He was happy. I was snickering. 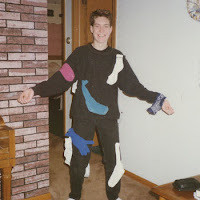 My friend caught up with me that day, and laughed hysterically as I told her what she caused. "You actually gave it to him? ", she asked. "Kind of," I said. "I gave him A number to my house..."
"Well, I gave him the number to my internet phoneline. That way, it will actually dial, but it will always have a busy signal," I smirked. "By the way, thanks," I said to her. Luckily, this happened on a Friday, so it wasn't like I had to run into the guy the next day. About a week passed, when we crossed paths in the hall. I said 'hey' and tried to keep walking. He stopped, indicating he had something more to say. I slowly stopped. "Hey, I've been trying to call you for a while, the number is always busy," he said. "I know, I have two sisters, and we're always on the phone," I lied. I was happy with my answer. He looked at me, frowning. "I know you gave me your internet line." "What?" I asked, playing dumb. "Yeah, I heard through the grapevine..."
On a similar note: I found this the other day. Of course, an iPhone app sounds like the answer to getting out of an awkward situation, for sure. I am a proud owner of the iPhone, and I'm considering purchasing this. BRILLIANT. "Sorry, you have the wrong number..."
This weekend I was waiting to get picked up to go to work, when my cellphone rings. I didn't recognize the number, so I was hesitant to pick it up, but I did. "Hello?" I say. All I got on the other end was heavy breathing. "Hello?" I repeated. Then, the voice says, "Fred? 'That you?" It was an older man and he sounded very upset. "No, I'm sorry, I think you have the wrong number." "No," I said. "This isn't Fred, you have the wrong number." The old man, obviously upset, does not give up. "Fred, I need your help...I need a boost...My car's dead..." He's sighing heavily, and out of breath. "Sir, this is not Fred, nor does this phone belong to Fred. You have the wrong number," I said, getting irritated. At this point, I wasn't sure if someone was prank-calling me, or if this old man was actually in trouble. It's around 9 a.m. on a Saturday, and I didn't think that any of my friends would take the time to prank call me at that hour. It was really bugging me though. I was torn between hanging up, or helping this person. I was trying not to laugh. This person simply wouldn't listen to what I had to say. Honestly, I don't even sound like a Fred. What made it awkward is the fact that this person wouldn't acknowledge they were wrong, and would not hang up. I sat there on the phone, wondering when the appropriate time was to hang up. I didn't want to be rude...but I was getting a little mad, that he wasn't listening. I ended up just saying, "Okay sir, I'm sorry, but this is not Fred. I have to go nowwwww....(slowly taking phone away from my ear... looking at it...and...click.)" Awkward. Sorry pal, hope you got a hold of Fred. By the way, I am a fan of the occasional prank phone call. 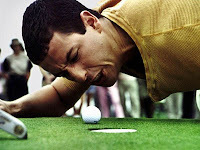 Here's one done by Adam Sandler. Did you watch the opening ceremonies last night? There were fantastic moments, and the entire show was quite emotional, powerful and overall beautiful. 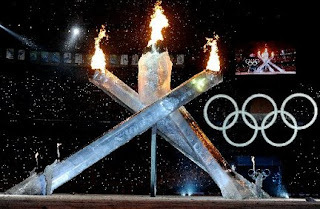 When Wayne Gretzky, Steve Nash, Nancy Greene Raine and Catriona LeMay Doan were set up to light the cauldron inside BC place, an awkward situation kicked in, while the world watched in confusion. These four, prime Canadian athletes were each supposed to light the columns that would in-turn, ignite the main torch, indoors. As they stood there with their torches lit, there was an awkward silence, when nothing was happening. They were just looking into the crowds, standing there, waiting. It was then, during the broadcast, when Brian Williams announced "it seems that there's a technical difficulty..."
"The Ceremony suffered a technical hitch when only three of the four columns, designed to support the temporary cauldron inside BC Place, rose from the ground." That left speed skater LeMay Doan, out of the loop. How awkward. What was going through their minds at that point? "Okay guys, who's sitting out on this one?" That must have been embarrassing for her. Not only that, but it seemed like everything else in the show went off without a hitch, and the most important moment presents itself, only to deflate before our eyes. Unlike the fourth column, hopefully Canada will "rise to the occasion" as the games begin today. Who would have thought that these two items (olympic mittens and a motorized cart) would launch me into another awkward situation. 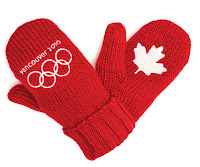 I finally found the rare-to-find red olympic mittens, where the proceeds go towards athletes in the Vancouver 2010 olympics. Took me a while, but Zellers finally had some. The display was right as your walk in the door, kind of in the middle of the isle. As I said "Yay! "- in my head- I quickly walked over and started scoping them out. I was trying them on, and looking for ones with the "best" stitch-work, walking around the carboard display. Crammed in between the isle, out of the corner of my eye, I notice a lady in a motorized cart approaching me. I tried to get out of the way... and she called out , "Uh, excuse me, miss?" I thought she was talking to me, and I did the quick turnaround to confirm, but she was talking to a woman that worked there. "Yes?" the employee said. "Could you help me? Do you know where the WOMEN'S UNDERWEAR ARE?" the lady on the cart said, in a rather loud voice. Have you seen Austin Powers? The scene with the golf cart? Probably. Well, that's what proceeded to happen. Forward. Backward. Forward. Back-For-Back-Forward. Backward."Wait!" she yells again, even though the employee was still standing there waiting. All of a sudden, she kicks it into drive, hammers the gas and just completely smashes into the cardboard display of mittens that I'm trying to quietly pick through. "BAM!" Well, after I had a heart attack, I couldn't help but laugh. I laughed into my elbow-crease, as if I was coughing, and the woman says angrily, "This thing HAS A MIND OF ITS OWN!" That did me in. I quickly walked around to the other side of the display and looked at gloves there, so I could laugh in privacy. I wasn't alone though, a man was on the other side, frantically digging through the popular, must-have MITTENS. He turns to me and says, "Hey, uhh, they don't have these in gloves, do they? Like, with fingers? Just these red mitts?" I looked at him like he was stupid, because honestly, it was a stupid comment. Those mittens have been on TV since October, they've been seen everywhere on Canadians. "Uhh, no, just the red mittens," I said. Just then the lady must have straightened out her cart, because she shouted, "Okay! Now where are those underwear?" It was just an awkward situation for me. You had to have been there. 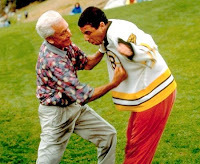 All I was thinking in my head while I was paying for the mitts was, "blog." I have a background in broadcasting, and I enjoy making people laugh. I like to entertain people. I am forever quoting movies and tv shows... it's a habit that I can't avoid. My humour is what can sometimes lead me into awkward situations, but I'd rather use humour to tell them to people.